zxspectrum, a set of utilities and macros to make working with the ZX Spectrum specifically easier, including labels for important routines in the Spectrum 48k ROM. These packages wouldn’t have been possible without Russell O’Connor’s excellent article in The Monad.Reader Issue 6, “Assembly: Circular Programming with Recursive do”, which was the main inspiration both for those packages and for this post. Here’s the game we’re going to be making. It’s basically a port of the project pursued over the course of this great set of ZX Spectrum tutorials, which itself is a clone of the game centipede. You can play it directly on this webpage, or you can download the .tap file for playing in an emulator here. I made some of my own customisations along the way, but credit for most of the actual assembly code must go to those tutorials, which were an excellent resource for me while I was testing these packages too. Thanks! OK, without further ado, let’s get started! This is a literate Haskell post, so when it is executed the lines prefixed with > are compiled and run, and the .tap file which is embedded above is generated. OverloadedStrings, as always, is just a convenience – but a very useful one as any strings you want to print to the ZX Spectrum screen are bytestrings, so it’s nice just to be able to input them as strings. RecursiveDo allows us to define labels after they are used, i.e. to jump to code which comes later in the file – a common idiom in assembly programming. The following language pragma and import are optional – they give us access to Unicode symbols which I think happen to look nicer on this blog. The z80 package tries to define an assembler as close as possible to the original Z80 assembly language – some of the syntactic differences I will cover in a moment – but the result of this is that some names from the Prelude are overloaded. Here we hide those names so we don’t get clashes. If you really need access to the original functions, you can always re-import the Prelude qualified. We don’t actually use anything from Data.Bits in this tutorial, so the import is redundant in this case – I include it here so you can see all the names you may have to hide when you make these standard imports. Finally we import Data.ByteString so that we can do things like test the length of strings we embed into our program. This particular program will all be embedded within a single main function, however it does make use of one Haskell datatype, which we use in a code-generating macro. Types can’t be defined inline, so let’s define it up here so we can use it later. For convenience, I’m also going to put the title screen into a global constant since it’s rather a long filename. You can download the title screen (a result of my unparalleled skill in art, as I’m sure you’ll agree), here. You’ll need a ZX Spectrum SCR viewer to view it, though. The first line of our program proper sets off the assembler on the rest of the code. defaultMain is provided by the zxspectrum package and right now is fairly unsophisticated: it takes the name of the program, the filename of its loading screen (in the ZX Spectrum standard .scr format), and an ASMBlock, and outputs (as a side effect) a .tap file ready to load in an emulator. Future versions may include some command-line parsing so things like the loading screen are optional, but for now it’s very simple. The z80 package provides a type called Z80 which represents the state of the assembler – the functions representing Z80 instruction code form an EDSL inside this monad. To get from a Z80 to an ASMBlock, you need to pass it to org, which will set the origin location, from which all further labels are offset. This is slightly different from standard assembler, where org was just an assembler directive which could be called at any time. Finally the mdo above opens a RecursiveDo block. If you’re not familiar with Recursive Do, it’s basically the same as do except that you can use values before they are defined. The loader code generated by defaultMain will, by default, assume that the entry point to your application matches the first line of assembly – i.e. the address you pass to org. However, we often want to define a block of static data that we will modify in our program first, and begin execution after this. This is made possible by the beginExecution directive, which sets the entry point to the address at which it is called. It may be used at most once in a program, and if it is never used the entry point is assumed to be at the start. This is what allows us to define the following data without worrying about the Spectrum trying to execute it! Here lambdamanScoreText is a Haskell variable which we use immediately below to define lmName, an area of memory in our output binary containing the value in lambdamanScoreText. We do this because later we will want to query it for its length, so it is useful to store it in a variable rather than using a literal. The same goes for the centipede. These represent the labels which appear at the bottom of the screen. The Haskell is a bit more verbose here, but we make up for that later with its macro-defining power. Onwards! -- flag - player dead when non-0. Here we define the state relating to the player. plx and ply represent the player’s own co-ordinates, while pbx and pby represent the co-ordinates of the bullet the player fires. dead simply tells us if the player has been killed. The original tutorials on which this is based swap the x and the y co-ordinates, so that x describes how far down the screen we are and y how far across. I found this too confusing, so I have a more traditional co-ordinate system here where x is horizontal, y is vertical, and the origin is at the top-left of the screen. Another syntactic difference here is the use of Haskell list notation when passed to defb. defb takes either a ByteString or a list of Word8s, and puts the values into the final binary file as-is. Fairly obviously, here we keep track of the scores. >   -- Table of segments. >   -- Format: 3 bytes per entry, 10 segments. >   -- byte 1: 255=segment off, 0=left, 1=right. >   -- byte 2 = x (vertical) coordinate. >   -- byte 3 = y (horizontal) coordinate. Here we set up some space for the centipede segments. The comments describe the format – the co-ordinates of that segment and whether it is going left or right (or has already been destroyed). As you can see we take a list of 8 strings, each 8 characters long. Each space is considered “off”, while anything else (here I use the s character) is “on”. From this we can automatically generate the bytes representing that character. These UDGs are defined one after another in memory. In a moment, we’ll put the location of the beginning of this block of memory in the special memory address UDG_LOC, which will tell the Spectrum ROM to look here when printing UDG characters. Sound on the ZX Spectrum – at least the original 48K version – is handled through the use of a simple square-wave beeper which can be set to oscillate at a certain frequency for a certain length of time (during which execution is blocked). As such sound effects are less “data” than they are functions which you call, setting the appropriate registers and executing the ROM routines which cause the beeper to oscillate (appropriately named BEEPER). However, the zxspectrum package provides a couple of macros to help with this. The one we use here, playSeq, takes a list of pairs specifying notes and their durations, and generates a function which will play the notes in sequence. Execution is blocked, so for in-game sound effects we have to keep them fairly short so they don’t interfere with gameplay too much. The sound effects below were designed and tracked by my good friend Alex May. The comments describe what each effect does. sfxHitC and sfxHitM are both run during gameplay, so they have been kept short and sweet. The other effects happen at a point where the game is halted for some reason anyway, so we can afford to play something longer. Since these are functions and not really data, of course, they must end with ret to return exeution to whatever called them – otherwise the program counter will just keep on running past them! Before we get too heavily into the code, I’d like to say a brief word about the differences in syntax between traditional Z80 assembly code and the embedded assembler exposed by the z80 package. Pointer dereferencing is done using square brackets  instead of round parentheses (), as there is no sensible way to detect the presence or absence of the latter in Haskell. Instead, I hijack list syntax to represent dereferencing. Using the empty list or a list with more than one entry obviously won’t work here, so… don’t do that. Traditionally z80asm is case-insensitive. Haskell is not. Personally, I find having a separate namespace (i.e. capital letters) for registers and ROM memory locations to be useful, but if you want to be able to use lower-case labels for your registers (ld a 4 as opposed to ld A 4) you can; just add import Z80.Operands.LowerCase to the top of the file. That’s about it – everything else falls naturally out of standard Haskell syntax. As we go on, I may show some examples of the two side-by-side so you can get a better idea. There are two simple bits of initialisation we’ll do once before the game starts, and then never need to touch again. The first is to set up the UDG location to print our “sprites”, and the second is to play the “game start” sound which will alert the user that the game has finished loading and they should get ready to play. This is because you can’t just arbitrarily load a number into memory; you have to load it into a register first and then load it from that register into the memory area you wanted. ldVia is so common that I have included it in the z80 package so you can use it out of the box. What this says is, “given an a that can be loaded into from c, and a b that can be loaded into from a, as well as the initial c, produce the assembly code to load c into a and then load that a into b”. Z80ASM is just a type alias for Z80 (). Whether this form of type-safety is actually useful is up for debate. With a traditional macro assembler, the macro would just be expanded and then assembly would fail from there. And the type gymnastics I had to do to make this look like Z80 assembler mean that the error messages when you get it wrong can be less than useful. But it’s interesting! And the type signatures are still useful, if just as documentation. After that, we play the intro sound by just calling the function we defined above to play it. That sets us up ready to start the game – the next step is to clear the screen (it currently has the loading screen on it) and set up the play area. We’ll do this between each round of the game, so let’s make a label we can jump back to when the player wins or loses. The first step is to set up our default colours and clear the screen to those colours. This is accomplished using a couple of helper functions from the zxspectrum package. The first two lines here are just macros which poke the appropriate data into the right bit of memory based on their parameters. The last line calls the CL_ALL routine, which is defined in the Spectrum ROM and clears the entire screen. Next, let’s write the scores on the screen. This is a bit of a diversion from traditional centipede; in this game you are battling against the centipede to see who can destroy their opponent the most times (spoiler: it’s probably the centipede). Every time you play, either lambdaman gets hit and dies, incrementing the centipede’s score counter, or lambdaman destroys all ten of the centipede’s segments, incrementing the lambdaman score counter. Since scores are only modified between rounds we can get away with rendering them once at the beginning of the round and then leaving them untouched, rather than re-rendering them every frame, which will save us precious cycles. We make use of a number of standard Spectrum ROM routines to accomplish this. PR_STRING prints a string formed by taking the address stored in the DE register, and n bytes after that, where n is the number stored in the BC register. OUT_NUM_1 and OUT_NUM_2 are both for printing numbers; the former prints the number in the BC register, while the latter uses the HL register and, more importantly, right-aligns the number. All this faffing about with what registers are used for what should convince you that just because we are writing Haskell, we are not writing high-level code here. This is still bona-fide z80 assembler; the Haskell is just there to give us a powerful, extensible macro system. The next step is to restore the player and centipede state. From the second round onwards this will have been modified by playing the game, so we need to initialise it to decent starting values. xor performs an XOR between whatever you pass it and the accumulator A, putting the result back in A. xor A, therefore, is just a really cheap way to set A to 0, since anything XOR’d with itself is 0. We use this trick to set the dead state to 0, meaning that the player is alive. We also set the number of remaining segments to equal the total number of segments, restoring any that were destroyed in the previous round. Lastly, we put lambdaman in the player’s starting position, at the middle of the screen on the bottom row. -- start off moving right. -- use B register as x coordinate. Here we set the initial state of the segments, which may have been scattered around during the previous round. We make use of decLoopB, a macro which puts the number you pass it into the B register and then decrements it every iteration, using the Z80 djnz operation to drop out when it reaches 0. The final bit of initialisation is to fill the play area with randomly scattered mushrooms. -- control code for AT character. -- get a 'random' number. -- want vertical in range 0 to 15. -- want another pseudo-random number. -- want horizontal in range 0 to 31. -- UDG 'B' is the mushroom graphic. First we set the attributes such that the INK is set to green, the colour of mushrooms the world over. Then we loop down from 50, placing mushrooms each iteration. The code looks complicated, but it’s actually quite simple: first we print the AT metacharacter which has to be followed by y and x co-ordinates, in that order. The co-ordinates, then, are randomly generated using the random function, which we’ll define later, and their range is limited using some binary arithmetic. We print those, and then finally print our mushroom sprite, which is UDG value 0x91. Here, “forever” is a bit of a stretch; naturally as this is assembly I can jump out of the loop to any other part of the program at any time – all the world’s a GOTO! Astute readers may have noticed that I use do here instead of mdo. We don’t define any labels within this sub-block, or need to use those labels before their definition, so we don’t need to make use of recursive do. We get all the labels from the surrounding scope, which is recursive, regardless. The main loop is mostly just a list of calls to other functions, which we’ll define below. The first thing we want to do every frame is delete the player sprite, so we can redraw it in its new position if it moved. Here we first set the cursor position to the player’s position, and then use wspace to draw a whitespace character at the current cursor position. We are now ready to handle input. I have two routines for input handling, though only one is necessary. The first uses the standard ZX Spectrum controls of Q, A, O, P and space, while the second uses vim-style controls of H, J, K, L, and enter. Both are always active, so you can play with whichever you prefer. The above functions will have updated the player’s position if a move key was pressed. We are now ready to redraw the player at their current position. Again we set our co-ordinates to the player’s position, but this time instead of using wspace to draw an empty character we use splayr to draw the player sprite. Next up is bullet handling. Rather than going into lots of detail here, I’ll just leave the inline comments intact. We’ll take a proper look at these functions later. -- check new position of bullets. -- print bullets at new position. And then we check our win/lose conditions. First, we check the dead flag to see if it is non-zero – if it is, we were killed so we should jump to the gameOver routine. Otherwise, we see if the number of remaining centipede segments is zero – if it is, we killed the centipede, so we can go to gameWon. If neither of these is true, we are still playing, so we can simply loop. The loopForever macro handles this for us, so we can simply end the block here. The following two routines handle input. I’m going to do the vim ones first because they demonstrate something quite interesting about how the ZX Spectrum keyboard works. -- see what keys are pressed. -- shift the next bit (l). -- it's being pressed, move right. -- get the next bit (k). -- being pressed, so move up. -- being pressed, so move down. -- finally, the next bit (h). -- it's being pressed, move left. The keyboard on the Spectrum was divided into groups of five keys, which could be queried at once and each individual key accessed by checking one bit at a time from the resulting value. As it happens, H, J, K, L and enter formed one of these groups, so checking the vim keys can be done with a single query! We then just rotate the accumulator one bit at a time, calling the function to handle that particular bit of input each time that bit shows the key is pressed. The standard Spectrum controls, Q, A, O, P, and space, are all from different groups on the keyboard, but they are generally the first or second key from that group, so although we have to do more queries, we don’t have to keep bitshifting the accumulator so much. A real game would probably have user-mappable keys and much more complicated keyboard handling routines as a result, but for our purposes this is perfectly adequate. We’re ready to start defining the actual gameplay entities, beginning with our hero, the player – Lambdaman. The following routine sets the cursor to the player position. It’s used to delete the character at the old position (by setting the cursor prior to moving the player, and drawing whitespace), and to draw the character into the new position (by setting the cursor after moving the player, and drawing the character). Player drawing is done by the splayr routine. 0x90 here is ASCII code for User Defined Graphic ‘A’, which is where we put our lambdaman sprite right at the start. The majority of player code is spent implementing the functionality enabled by the keyboard mappings above. First, though, we’re going to make a little utility function to check for the presence of a mushroom in the direction we want to move. Lambdaman can’t stand on top of mushrooms, so if there is a mushroom we want to return early – before we move the character. -- move to the position we want to check. -- address of attribute at this position. -- mushrooms are bright green (0x44). -- there's a mushroom - return early. The interesting thing to note here is that checkMushroom is a Haskell function, not a function in our program (i.e. a labelled block). What does this mean? Essentially, it acts like a macro in a traditional macro assembler – the code in the function will be generated at the call-site. Crucially, this means that the ret Z above doesn’t return from the function checkMushroom (there is no such function in the output assembly). Instead, it returns from the calling function. This, it turns out, is exactly what we want: to drop out of the calling function before the move has been enacted, in the case that the move would result in Lambdaman standing on a mushroom. In case it’s not clear from looking at the code, the way we check for mushrooms is simply to poll the attributes of the character. If it’s green, we know it’s a mushroom, because there are no other green objects in the game. This extremely primitive approach to collision detection was actually quite common in early Spectrum games! -- plx is "player x". -- what's the current value? -- yes - we can't go any further left. OK, so here’s the first actual movement function, mpl (for “move player left”). The principle is fairly simple, and we’ll see this pattern repeated over the next few functions. The basic idea is to load the current value, check it’s not 0 (the very left of the screen), and return if it is, check there’s no mushroom there, and return if there is, and finally – if we’ve made it this far – decrement the player’s \(x\) co-ordinate, thus moving it left. This function should look familiar. Instead of checking for 0, we compare against 31 – the rightmost column – and instead of decrementing we increment. Otherwise it’s basically the same. I could have extracted this pattern out into a helper function like I did with checkMushroom, but I actually found there were just enough differences that writing out the code for each case ended up being clearer than passing the parts which change as parameters to a function. The following functions do the same for the up and down directions. The only other routine left to define is missile firing. We keep this simple by only supporting one missile on screen at a time – that missile’s position is stored globally along with the player, as pbx and pby (player bullet x/y). When the missile is off-screen (i.e. there is no missile), we set the \(y\) value to 255. We can check the existence of a missile by putting its \(y\) position in a register and incrementing it. If it has position 255 it will wrap around to 0. If not, we know that it must be on the screen so we return early without spawning. To spawn the missile, we simply take the player’s position and increment the \(y\) value, placing the missile immediately above the player. OK, so now the player’s fired a missile, we need to make it do something! Missiles move steadily up the screen, which can be achieved by simply decrementing the \(y\) co-ordinate every frame the missile is on the screen. We first perform an increment to check whether the missile is on-screen. If not, we drop out immediately; if it is on-screen we subtract 2 – 1 to undo the increment we just performed and 1 more to actually move the missile. Finally, we load the register value back into pby. Next, we need to handle collision detection between the missile and the mushrooms (we’ll deal with centipede collision in the next section). The bchk routine checks the position of the missile and, if it hits a mushroom, destroys it. We do this by first checking the \(y\) co-ordinate to make sure there is a missile on screen at all, and if there is, checking the attribute at that location. If the character is green, that means it is a mushroom, so we can call the hmush function to destroy it. Otherwise, we simply return. hmush is very simple – we simply replace the character with whitespace and play the appropriate sound effect. We also set the missile’s \(y\) position back to 255 to signify that it is “off screen”. This last step is done within the kilbul label, which we can jump to from elsewhere in the program, but as hmush contains no ret statement it will run straight from call sfxHitM to ldVia A [pby] 0xff. You can think of it like a fall-through case in C switch statements, if you like (since the labels in a switch statement are essentially goto labels, this is actually a pretty accurate way to think of it). To draw the missile, we follow the same pattern as when we drew the player. bullxy sets the cursor position to the current position of the missile (which might be off screen). The pbull routine checks whether the missile is on screen, and if it is, prints the sprite 0x93, or UDG ‘D’, at that location. We clear the missile using the defbull routine. This is as distinct from kilbul, which logically “kills” the bullet, by setting its position to 255; here we are deleting the bullet’s sprite from its current position on the screen, but not changing the location of the bullet within the game logic at all. As with kilbul above, we run straight into the next function, wspace, to do the actual clearing of the sprite at the current position. This function is called from a number of places in code, but defbull has the advantage of being defined right next to it, so it can fall through to it without paying the cost of a function call. Note that we set the colours to white-on-black. This may not seem important, since we’re drawing an empty space so there are no foreground (white) pixels to display – but remember, collision detection is done using colour attributes! If we left the colours as they were, the space would continue to act as an invisible missile, or mushroom, or whatever was there before! Next, we deal with the centipede. Being composed of a number of segments, the centipede is actually fairly complex – though by and large the segments work independently, even while they appear to be connected together. We begin with a helper routine, segxy, which performs the same job as basexy and bullxy above: it sets the cursor to the position of the current segment. Now that we have this, we want to go through each segment (of which there are ten) and process them, one by one. We do this using the trusty decLoopB macro we made use of earlier. Each segment contains three bytes: the segment’s current status, and its \(x\) and \(y\) co-ordinates. Current status has three possible values: 0 for “moving left”, 1 for “moving right”, and 255 to disable the segment once it’s been destroyed. The loop below goes through each segment and checks whether the status is 255 – if not, it runs proseg to process that segment, otherwise it skips over that and proceeds to the next one. -- table of segment data. -- is segment switched on? -- 255=off  increments to zero. -- it's active, so process segment. -- 3 bytes per segment. -- get next segment in ix registers. The crux of the centipede’s processing code happens here, in proseg. As with the main loop, this is quite a high-level routine that delegates most of its actual processing to a few purpose-built routines, defined below. We begin by calling segcol to check for collisions with this segment. If there was a collision, segcol will have turned off the segment, so we can check for that and drop out early if that’s happened. Otherwise, we clear the segment’s previous position, move the segment into its new position with segmov, and perform another collision check. Again, we need to check whether the segment was destroyed by the collision. If it wasn’t, we draw the UDG character ‘C’, which contains our segment graphic. -- by collision detection routine. -- it was  so this segment is now dead. -- set up segment coordinates. -- display a space  white ink on black. -- new segment position collision check. The remaining functions therefore fall into two categories: segment movement, and collision detection and handling. We’ll deal with movement first. The segment is moving either left or right. We begin by loading the current co-ordinates into registers, and then checking which way it’s moving. If it’s moving left, we jump to the segml routine. If right, we fall through to the next routine, segmr. The two movement routines are very similar. First we check if we’re at the edge of the screen, and if so jump to segmd to move down one line. If not, we check the attributes of the space one to the right, to see if there’s a mushroom there (Remember, mushrooms are bright green: 0x44). Again, if there is we jump to segmd. If we passed both of these tests, there are no obstacles, so we can increment the \(x\) position to move the segment to the right. segml is almost identical. We use and A again to check if we’re at the left edge. Next, we define segmd, which the previous two routines used to move the segment down in the case of an obstacle or the edge of the screen. Whenever the segment moves down, it should reverse direction, so that’s the first thing we do here. After that, we check if we’re at the bottom of the screen – if we are, we jump to segmt to move us back up to the top. Otherwise, we move down – regardless of whether there are any mushrooms or other obstacles in the way. This prevents a bug from happening whereby the mushrooms form a sort of “bucket” that can trap a segment. This is the final movement function. All it does is to set the \(y\) co-ordinate to 0. The \(x\) co-ordinate will be wherever the segment was on the bottom line – usually the left or right edge, unless it happened to hit a mushroom. Finally, we handle collision detection for centipede segments. We’ve already dealt with mushrooms, which cause the centipede to turn and move down the screen. The remaining items a segment could collide with are the player, killing him and scoring a point for the centipede, or the missile, which turns the segment into a mushroom and destroys the missile that hit it. First, the player. segcol first compares the segment’s position with the player’s. If either the \(x\) or the \(y\) positions differ, it jumps to bulcol to try for missile collisions instead. If they are both the same, it falls through to the following routine, killpl, which sets the player’s dead flag. Checking for a collision with the missile is similar to the collision check above – we simply compare \(x\) and \(y\) co-ordinates. If either of them is different we know there is no collision, so we can return. If we get this far, there has been a missile collision. We call defbull to delete the missile graphic, and then replace the segment’s own graphic with a mushroom. Finally, we call kilbul to “logically” kill the bullet, setting its \(y\) co-ordinate to 255, and we also flag the segment as inactive. If there are still segments left, we play the “segment hit” sound effect, otherwise we don’t need to play any effect because the game over sound will play. And, that’s it for the centipede! There are a couple of utilities we’ve made use of in this game, both of which are taken from the same set of tutorials where I got most of the code for the rest of the game, but which would be useful in any game, not just this one. 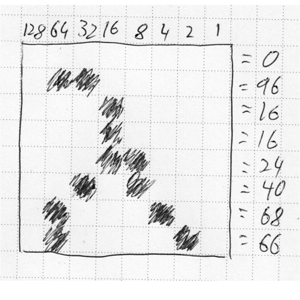 The first is a pseudo-random number generator which cleverly uses the Spectrum ROM itself as its source for randomness! It simply treats the seed as an offset into the ROM memory. You can see a fuller description on the original page, but here’s the code. The other utility which has come up a lot is atadd, which calculates, from a pair of \((x, y)\) co-ordinates, the location in memory for that co-ordinate’s attributes. This is extremely useful for polling co-ordinates for their attributes, which was the basis of all our collision detection. The original utility, with comments, can be seen here. We’re just about ready to wrap up our game! The last thing remaining is to deal with the two end conditions – either the centipede killed Lambdaman, or Lambdaman killed the centipede. In either case, we play a sound effect, increase the appropriate score, and jump back to gameStart to begin the next round. Out game is done, but because of the way labels work in z80, it is common for the last line in any program to be a variable definition (in this case gameWon). This, of course, is not allowed in Haskell, so z80 defines end as an alias for return (), giving us an expression to end on. With that, we can compile and run the program, which should spit out a file called lambdaman.tap which you can load into your favourite emulator.